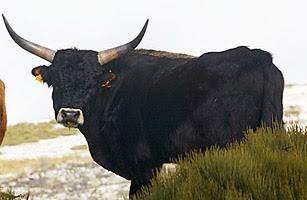 Aurochs, the extinct wild European cattle. A very interesting article that I read today, written by Stephan Faris (Breeding Ancient Cattle Back from Extinction) tells about a project to bring them back from extinction. Aurochs were very big bovids, over 1,80 m (6 ft.) tall at the shoulder and weighed more than one ton. They ran wild until the end of the Middle Ages, when over-hunting and habitat destruction drove them to extinction. The last one of them died in 1627 in a Polish nature reserve. Scientists aret trying to bring it back from the list of extinct species. If they succeed, it will be the first animal to be brought back from the dead. Read the full article on line at Time Magazine’s website. Stephan Faris Breeding Ancient Cattle Back from Extinction. 12.02.2010. Time Magazine. Auroch (Bour in Romanian) is both on the old Moldavian flag and on the current Romanian emblem.